With last week’s article on how sitelinks work and how to change them to benefit your business, I thought it would be good to explain why Google made this change to the search engine results page. So why did Google make this change? What’s really happening with sitelinks? Google’s goal is to provide users with the most relevant and useful results as possible. Learning about what people are looking for when they search for your brand/website, will help Google achieve this. Google is using this to learn what people want from your website. Being the reason they haven’t given you full control of what links appear under your brand search. Google knows if it was up to you that you would only show what you wanted to sell and not what the customer wanted to find. Over the next few weeks you should start to see the links changing as Google will be working out what people are actually looking for on your website. 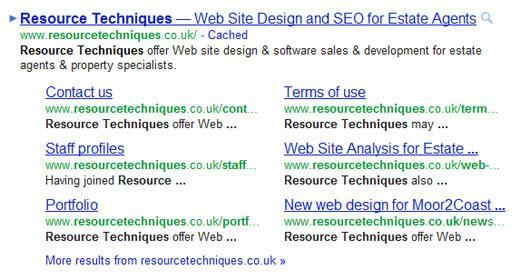 Google aren’t the only ones who can learn from sitelinks. Using Google analytics you will be able to better understand what people are looking for when they search your brand. With this information you can see how people view your website and its ability to convert people once they are there. Figuring out what people are looking for when they search for your business directly can help you work out the process they go through to view your properties... do they go straight to property search? Do they look at your testimonials page? Contact page? Etc. You will then be able to use this information to better the user experience on your website.